First get your grill heated to a high heat. 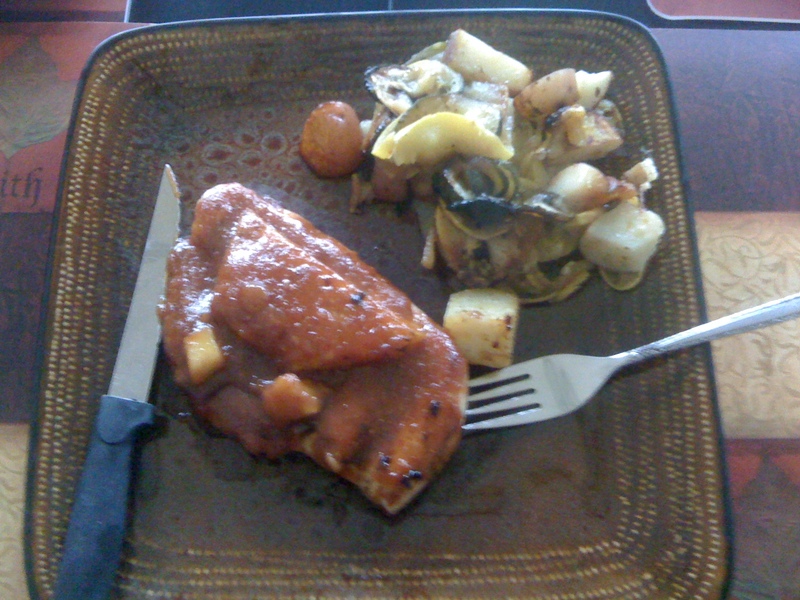 While that is going, quarter your red potatoes, slice your squash and onion, and place on a large piece of foil. Use a little olive oil to coat and a tablespoon of butter on top. Season with salt, pepper, and the Emeril’s essence and close packet. Poke a few small holes on top of the foil and place on grill. Now grab your chicken breast and slice in half like filleting a fish to get 2 thinner breasts. After all chicken is slices set aside. The Sauce, take your favorite bbq sauce(I use Sweet Baby Rays) put a cup to 2 cups in a chopper or I use my wife’s smoothie machine. Now add about 1 to 1 1/2 half inch slices of pineapple to the sauce cut in large chunks. Add a tsp salt, pepper, 3tbs of bourbon, and Emiril’s to the sauce and chop or blend until pineapple is diced. If you like chunks of pineapple in the sauce cut a few up and add afterwards. Now that the sauce is done place the foil veggies on the top rack and lightly oil the chicken breasts. Place on grill and lightly coat with the BBQ sauce plain only, After cooking til done. Place chicken in a broil pan and coat heavily with the pineapple BBQ sauce that you made. Place under broiler until sauce gets thick, do not burn maybe 5 miniutes. Now plate and serve. You can also use this sauce on your favorite wild game like rabbit, oe grouse. Please subscribe to my blog if you like it, I appreciate everyone who reads.. This entry was posted on May 27, 2011 at 7:16 am and is filed under 6or7, antlers, archery, bear, deer, experience, fishing, fleece, g5, Hunting, outdoors, recipe, reviews, scent-lok, sheds, sportsman, team dirt, typical, Uncategorized with tags 6or7, antler, antler king, archery, bear, bows, deer, duck, fishing, g5, guns, hunting, moose, outdoors, rabbit, real tree, Ruttin' Review, small game, sportsman, squirell, target, thenontypicalsportsman, typical, waterfowl. You can follow any responses to this entry through the RSS 2.0 feed. You can leave a response, or trackback from your own site.